CNBetter Media is a multi-faceted media agency with a specialized suite of services including public relations, brand building, event planning, experiential marketing and social media strategy. Primarily, we work with film studios and television networks to strategically position new projects in front of African American & Urban audiences. We also work with celebrity clients to amplify the visibility of their personal brands and involvements, and we consult with large corporations, small businesses and individuals to present real, consistent and impactful messages on platforms that matter. We are brand amplifiers, content creators and influencer engagers who raise profiles socially, professionally and personally. With VISION, STRATEGY & SUCCESS, it won’t be long before you’re #CNBetter! Candace Ledbetter is recognized as the “go-to” girl in the industry of media and entertainment. 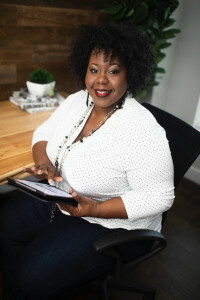 A graduate of Virginia State University (VSU) and a member of Delta Sigma Theta Sorority, Inc., her evolution of success has transformed her from being every child’s favorite 8th-grade language arts teacher to being a highly respected industry professional and speaker with social influence, valued relationships and a stellar reputation. Candace has had a very exciting professional journey. After her season as an educator, she served as a freelance writer and editorial assistant for regional and national magazines including Gospel Today Magazine, Average Girl Magazine, Written Magazine, The New Birth Voice, VerticalFix.com and ATLBlack411 where she penned a variety of content pieces from holiday gifts guides to inspirational articles and full feature editorials. In 2007, she became the Director of Marketing & Communications for the Atlanta Metropolitan Black Chamber of Commerce where she aided in the exposure and professional development of Atlanta’s bustling small business community. Simultaneously, in 2008, she became the producer of the “Quiet Storm “and “Love & Relationships” shows hosted by Joyce Littel on Atlanta’s heritage “People’s Station,” V-103. Because of her creative broadcast structure, she was requested to script and produce special radio shows featuring celebrities like Al B. Sure, Kandi Burruss, Jagged Edge, Brian McKnight, Boris Kodjoe & Nicole Ari Parker and many more. She also produced shows for sister station, News & Talk 1380 – WAOK, including Real Estate 101 with Mary Gill, The Rick Joyner Show, Too Much Truth with Derrick Boazman and POWERTALK w/ Lorraine Jacques White. In 2011, Candace was promoted to Promotions PR Manager for V-103 and WAOK where she focused on media relations, event planning, integrated marketing and promotions. She also served as the celebrated social media voice of both stations who helped to establish and grow their social channels and platforms as well as their audience of followers. In 2014, Candace pursued the next level of her career by contracting with accomplished agencies where she served in Sr. Publicist and Account Director roles. Through those experiences she fortified relationships with general market, urban and niche media outlets, and helped to manage/oversee the press efforts and event experiences of the following entities: ESPN, Fox Searchlight, Disney, Magnolia Pictures, Focus Features, Oxygen/Bravo, Paramount Pictures, Oprah Winfrey Network, REVOLT TV, Strength of Nature, the ESSENCE Festival (2016 & 2017) and many more! Today, Candace is the owner and principal consultant of CNBetter Media – a multi-faceted media agency specializing in public/media relations, brand building, event planning, experiential marketing and social media strategy. Primarily, she works with film studios and television networks to strategically position new projects in front of targeted audiences. She also works with celebrity clients to amplify the awareness and involvements of their personal brands, and consults with large corporations, small businesses and individuals to effectively position themselves and get the visibility they deserve. Exclusively, under the umbrella of her company, Candace has experienced great success! In 2018, CNBetter Media was named the “Agency of Record” for the 26th Annual Pan African Film Festival, was contracted as a U.S.-based publicist for Jamaican beer giant, Red Stripe and currently manages the publicity efforts for Double Grammy and Double Oscar Award-Winning Balladeer, Peabo Bryson, where she works very closely with Capitol Records, Caroline Music and Perspective Records – the label owned by legendary super producers, Jimmy Jam and Terry Lewis! More exciting updates to come! #StayTuned! 7 months ago Hey @roncorning! My client, #PeaboBryson is coming to Dallas on 9/14. Would love to bring him by @wfaagmt! Who should I coordinate with? 2 years ago Hey @Chillerspeak! #HappyHumpDay :). Shot you an email. Let me know you got it. Thanks! 4 years ago RT @Zo3hree5ive: @AceofNSU Feel free to start here... --> http://t.co/1VMjfCbKcc Thanks for the recommendation, @MediaQueenATL!! 4 years ago RT @MediaQueenATL: @AceofNSU - Also, check out the #AvilaBrothers! Their single #iWantYou got me hooked on them! 4 years ago RT @MediaQueenATL: @AceofNSU - Also, check out @thisismoonchild! Their albums #BeFree & #PleaseRewind are #amazing! U'll love them.